At the start of July Cockpit Arts in Deptford welcomed five weavers as part of The Clothworkers’ Company Awards. The awards, which are open to weavers who have graduated in the last five years, aim to assist weavers to set up in business by providing weaving equipment, business coaching and support. The 2018 weavers are: Sophie Graney, Vicky Cowin, Elizabeth Ashdown, Poppy Fuller Abbott, Alice Timmis and Claire Whelan. Alice Timmis is an artisan manufacturer working with the fashion industry. Her fabric collections combine industrial and hand-woven techniques and finishes. Weave is very linear. Alice tries to get away from that by treating her fabrics once they are off the loom with a range of finishing techniques including brushing, felting, shrinking and hand embroidery. This year, especially, has been the busiest yet for her with collaborations with a number of London fashion designers for their A/W 18 collections. The fabrics that Alice created for designers were produced either by hand from her studio space in Cockpit Arts, or industrially in mills. 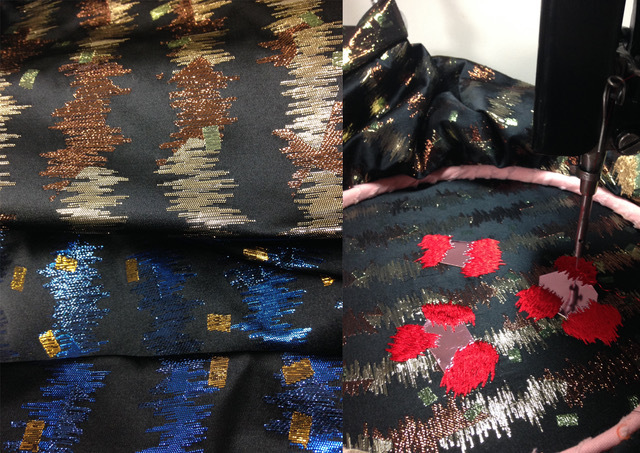 Working locally to London fashion designers, Alice offers bespoke and innovative fabrics that can be produced through various methods depending on the style of the client’s fashion collection. Alice also freelances for the well established woven studio, Dash and Miller, through whom she sells her woven mixed media designs internationally to mills and well known fashion houses. Sophie combines hand woven techniques with her passion for material exploration and unconventional yarns; valuing craftsmanship and allowing different materials to inform and construct her designs. 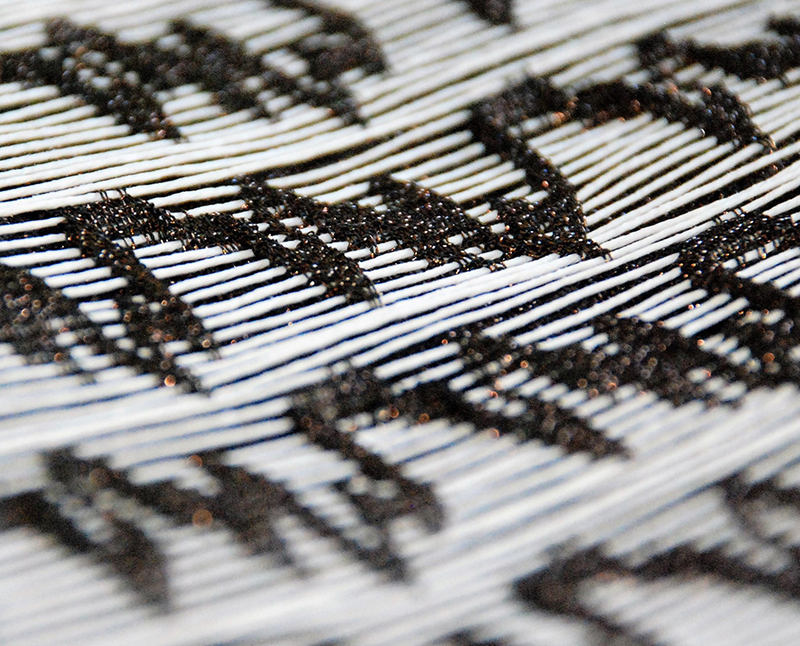 Whilst studying at the Royal College of Art Sophie’s dissertation explored the idea of how space can effect innovation within woven design. She came to the conclusion that space away from fast production and quick deadlines allows time for more experimentation and development of materials. From this she creates work focusing on innovative aesthetics using hand developed yarns resulting in hand focused techniques. 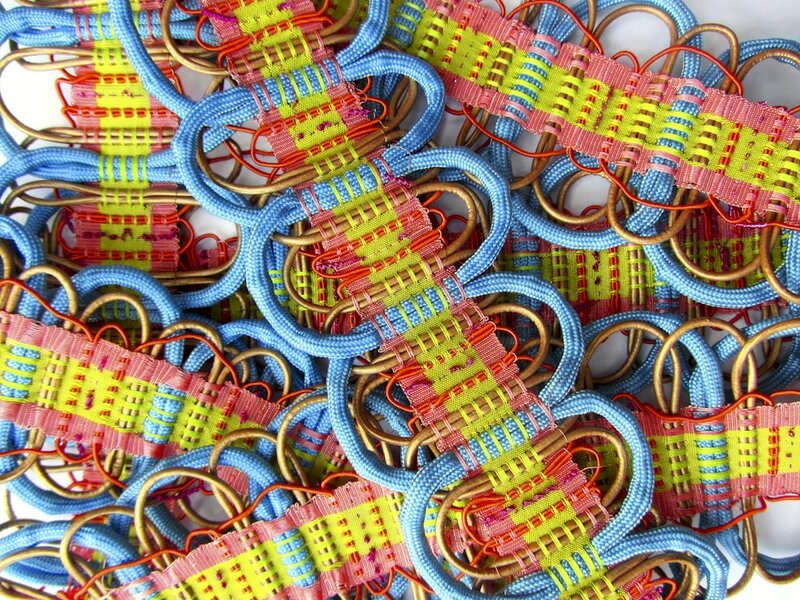 Inspired by psychogeography and urban wandering Sophie begins her process by documenting her surroundings, absorbing the colour, texture and compositions of urban environments which she translates into colour stories and yarn developments. Inspired by the rubber tube cables alongside the tube tracks in London , Sophie began to explore synthetic yarns. 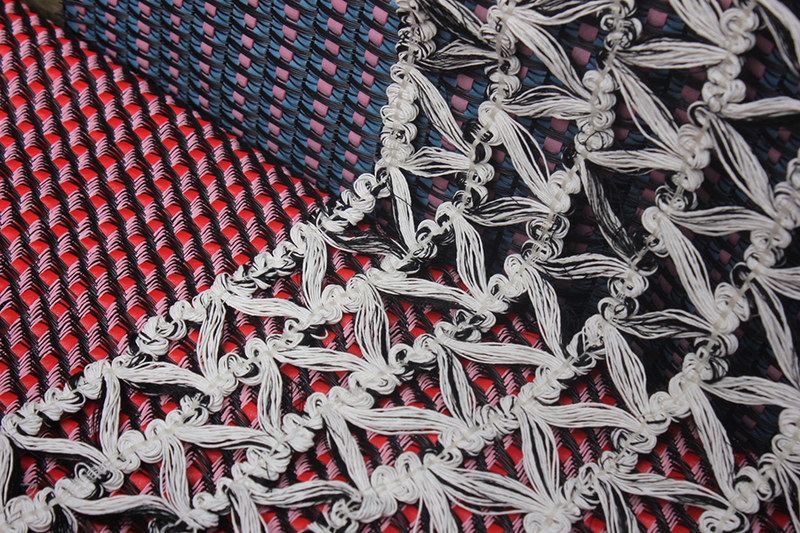 Rubber coated yarns dominate her collection ‘Solid Wovens’ which was showcased at the Royal College of Art in June, alongside hand developed PVC and leather yarns with thick chunky sections (which are made from up to 100 ends). Traditional techniques such as Swedish lace and hand weaving on dobby looms allow Sophie to suggest movement and depth through her hand developed yarns. These hand crafted techniques not only allow Sophie to use exciting materials but also control every single aspect of her work. The different fibre properties used enable her to create exterior fabrics for the garden which she hopes are just as exciting as indoor fabrics. Sophie’s fabrics are suitable for rugs and upholstery as well as decorative panels and table decorations. Sophie currently has a studio at Cockpit Arts in London where she is planning on developing her own products from her hand woven fabrics. Vicky uses complex techniques to weave her tactile designs, unexpectedly combining colour, texture and pattern with a 3d element to achieve unusual effects. 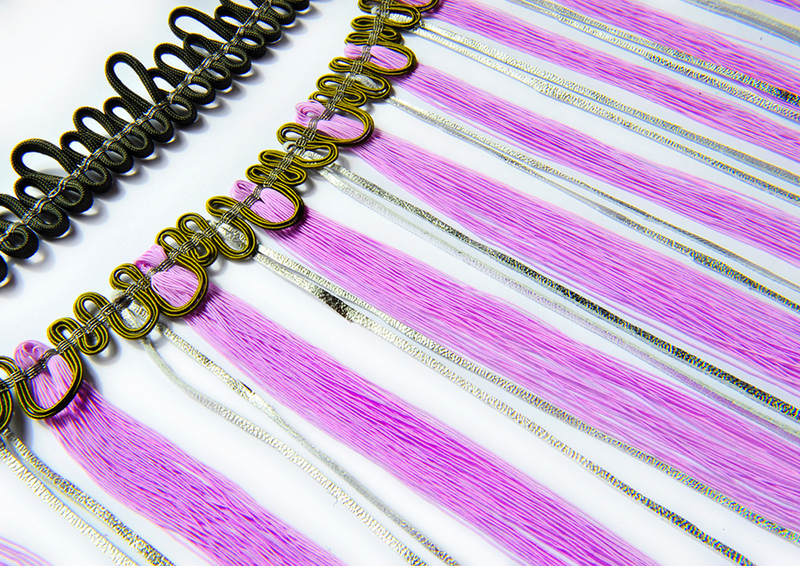 She is inspired by rituals and symbols and her own experience of the meditative and ritualistic qualities of weaving. She has been weaving art pieces and is currently developing a collection of cushions launching in A/W18. 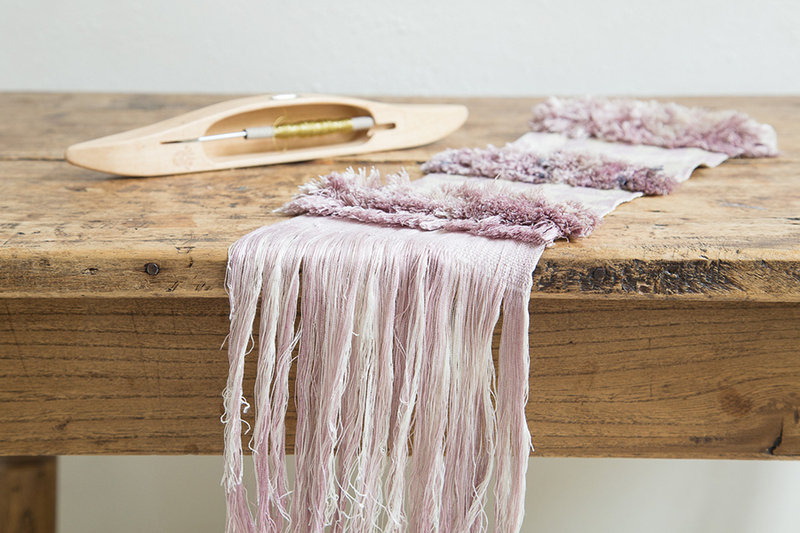 Poppy is a weaver based in London who creates experimental pieces that take the form of textiles or textile objects. A large source of her inspiration is drawn from magic and superstitions and how textiles tie into history, mythology and language. Despite strong roots in the past, Poppy maintains an innovative approach to weaving where she works quite conceptually to achieve her abstract and contemporary designs. Focusing on responsible production, Poppy is considerate in her use of materials and is currently experimenting with various hand dying techniques using natural dyes. For Poppy, the investment of time and skill makes handcrafted items precious and she wishes to preserve this quality in her work. Sumptuous cushions, beautiful cashmere scarves, vibrant throws and hangings… a handwoven Claire Whelan original is something you’ll treasure, for your home, to wear, to give. 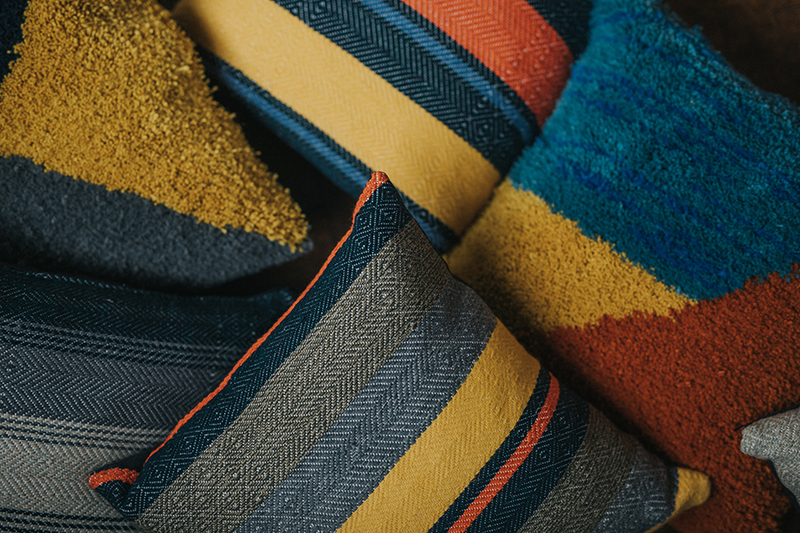 All woven from original designs, you can choose your own unique colour scheme or select from an existing Whelans Weaving palette. Whether you’re looking for a bespoke fashion piece, items for an interior, or a ‘one off’ art piece, you’ll get the guidance and professional judgement for a lovely result. This entry was posted on Friday, August 10th, 2018 at 9:43 am	and is filed under Awards, General, New weave developments, News. You can follow any comments to this entry through the RSS 2.0 feed. You can leave a comment, or trackback.